When I finally got home last night, my neighbor's air conditioner was humming, and I had high hopes that my power would be on too. AND IT WAS! AND IS! It went off Friday 9/12 at about 11pm, and came back on Monday 9/22 at about 6pm. The house has different sounds now - the fridge making ice, the fan creaks, the little noises that I didn't notice before. The thing I really appreciate the most is being able to move the air. We have had very little breeze and the house was really getting stuffy. by Seth Lerer. A really great way to beat the frustration of traffic! The city is still recovering from Ike, and will be for a while. Many schools are not open, and of course the further south you go towards Galveston, the worse the damage gets. I feel very lucky to be able to have my fan and dishwasher and fridge. Well theoretically I should have power on Monday... When will you get power? I grew up having limited access to 24 hour electricity, so I already appreciated it. But it's been more than 35 years since I had to live without power and it sure is easy to get used to comfort! Especially in a hot, humid environment - and in a house that isn't set up to work without it. Well, the drive up to Houston from SPI was uneventful. I stopped in Refugio for gas and groceries (paid $3.69/gal) and then again in Wharton (again, $3.69/gal). Started out kind of sleepy, but by 9AM the phone was ringing constantly so that got me awake! I drove straight to the house and sure enough the power is still off. Argh. But, the water heater and the stove top are natural gas so I will be able to cook and also take a hot shower! The yard looks nice because the yardman came. There are huge piles of debris on the edge of each street. The mayor has said that heavy debris will picked up "sometime soon" by contractors other than our regular garbage folks. I spent the balance of the day at one of our apartment complexes, meeting with adjusters and attempting to balance insurance requirements with corporate urgency. Everyone is stressed and the calls are sometimes strained. But we will get through this. It's only day 5! As I look out over the city there are quite a few lights on - and huge swathes of darkness. 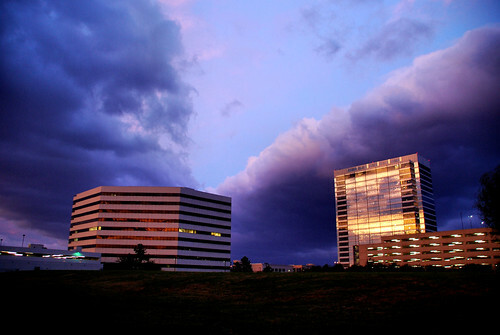 It took me an hour to go the 11 miles from my house to our office in Greenway Plaza. Traffic lights were working on one block, flashing red on another, and just plain OUT on others. And it changes from block to block. Hardly anyone remembers how to handle a 4-way stop, especially on roads like Westheimer with three lanes and left turn lanes as well. I've got a option to stay at my boss's home near the office, but will try one night at my own home just to see what it is like. Fortunately the weather is quite cool especially by Houston standards. Tomorrow, (Thursday 9/18) I'm heading back into Houston to work. There are some things that just have to be done in person - like picking up invoices and moving them on to their proper destinations. Our neighbor says that there still is no power at her house or probably at our house either. But the Randalls at Westheimer & Wilcrest and the HEB at Westheimer & Kirby are open and selling. And there is gas here and there but she recommended getting it before I come into the city. Someone from my office in the Greenway Plaza are said they had no trouble getting gas at the Citgo at Richmond & Kirby. I've heard the word "spotty" applied to electricity and fuel availability by so many people. I plan to leave around 6am and hopefully pull into the office around noon. looking east on our street, originally uploaded by AmyEmilia. This is what our street looked like on Saturday 9/13. There was some flooding but the tree damage isn't too severe. You will note that there is a light on in the house to our left. That house has power. The house just to my left (invisible behind it's dangling pine branch) has power in PART of the house. Apparently one leg of the power is on and one is off. At least, that is what an electrician told my neighbor. Odd. This may also be true in our house since my husband told me that he noticed the internet cable modem lights were on when we were closing up the house to leave. We decided that since there was no power and no water pressure, staying in Houston would be silly when we have a perfectly good house in South Padre to go to. So around 2pm we packed up and left. I've got a few pictures of the drive down but it was not dramatic at all. We found gas outside of Victoria and paid $3.59 - not a bad price. The trip took 5.5 hours which is faster than normal. There was hardly any traffic. At least South Padre has power and water! We had a busy day today! 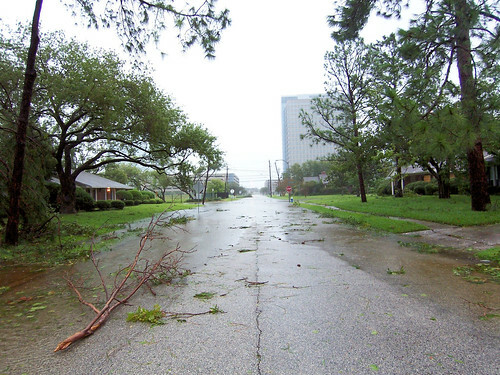 Of course overnight Hurricane Ike roared through our neighborhood. The wind was impressive, and I am so glad that we got those big limbs trimmed off our tree! Although there was steady rain, we never really got a deluge. Early in the morning (around 7 or so) the water was backing up in the street. I went out with camera, cell phone, and raincoat, and walked around. Cleared out the leaves and branches from one of street drains that was clogged. The little bayou was running fast, but the good news was that it was running downstream as it should. Which told me that our big bayou wasn't yet impacted by the big storm surge that pushed up into Galveston Bay, the San Jacinto River, and anywhere else that it could. By around 10 our street was clear of flood waters and they never got more than a couple inches up into our yard. I've definitely seen much worse from a violent thunderstorm. Tree branches were down all over the place, but no trees fell. Our street was easy to drive on. I picked up lots of limbs and piled them in the front yard. Hopefully the heavy trash folks will come by soon and pick them up. By noon, after listening to the radio and the neighbors, it became obvious that power was going to be out for a LONG time, perhaps weeks. And the water pressure was down to a mere trickle. So we decided to pack up and head down to South Padre Island. We are so fortunate to have another place to get, all set up and ready. A little ironic that it was only a few weeks ago that Hurricane Dolly was making her mark there. We left around 2 and arrived by 7:45pm which was GREAT time. The road was completely clear and dry. Closer to Houston the gas stations were all closed but once we got to Victoria there were many open and serving. We bought gas at the Victoria McDonald's truckstop for $3.59 which isn't a bad price! (They usually offer a fair gas price.) Almost the entire way down US59 and then US77 we saw houses and businesses boarded up. A reminder of how the forecasted track of Ike moved from south of Corpus Christi all the way up to Galveston. We arrived on the island just in time for the sunset and hurried down to the beach. There obviously was a huge surge, much larger than the one that Gustav sent a couple weeks ago. No trash cans on the beach so the city must have taken them away. The water was oh, so warm. The pink sunset and rising moon made for a good ending to a long day. Except of course my day was not done. All of my company's locations in Houston had damage from the storm, so I have spent the evening writing up incident reports, talking to adjusters, and getting things lined up for Monday morning inspections. Tomorrow I'll be working again most likely. Maybe, depending on the response, I may have to drive to Corpus to see any damage reported at our three locations there. We are relieved to have power and water, and a safe place to sleep tonight. The TV went out a few minutes ago... no great loss since we still have the internet (odd, that) and our handy little solar/crank/rechargeable radio/cellphone charger/flashlight. All it needs is a couple blades and it could be a really handy tool a la Swiss Army knife. My husband has gone outside to watch the wind. It is the most visible wind I've ever seen. It keeps tricking me too, since it sounds like a vehicle coming up the road. I guess that is the leaves rustling. Still not too much rain. I see from the radar that it is coming. The eye is very close to Galveston too. Thinking of all of you and hoping you are well. The drama of the storm is keeping us entertained and we are fine. clouds bands, originally uploaded by AmyEmilia. The clouds bands of Ike, spinning overhead and lit by the setting sun. The sunset was awesome - filling me with awe. We went for a quick drive down Westheimer, to see the town. My husband was hoping the movie theatre was open, but (as I hoped) it was not. So we made do with the powerful colors of the sunset and the dramatically moaning wind. The town is pretty quiet, with some traffic but almost nothing open. A very few gas stations were open as we went out but were closed by the time we came back, less than 20 minutes later. In a 5 mile drive we saw at least 5 police cruisers - far more than usual. I guess it's a good idea, since all those stores would be a temptation to some people. The wind is getting stronger but we have had almost no rain yet. tree trimming angel, originally uploaded by AmyEmilia. A miracle has occurred. We heard a chainsaw this morning and my husband went and talked to them... they were taking down a neighbor's tree. 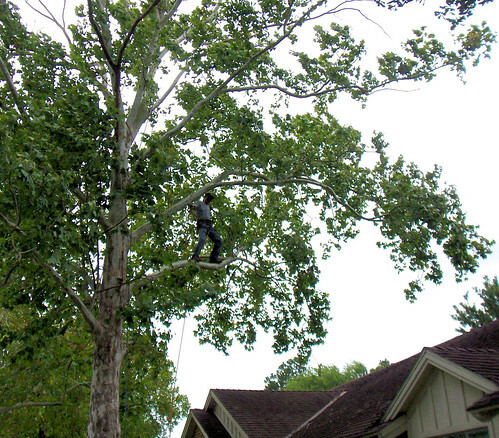 The three man crew agreed to come and take the limbs off our sick sycamore tree. And for a reasonable price, too! So the most dangerous, heavy limbs are down now and they will come back at the end of October to take out the rest of the tree. It was hit by lightning 3 years ago and has never truly recovered. The weather right now is beginning to deteriorate. Winds are up a little, and the rain is just beginning to drift in. I am SO grateful to these men, who were in just the right place to help us. THANK YOU! gathering nuts, originally uploaded by AmyEmilia. 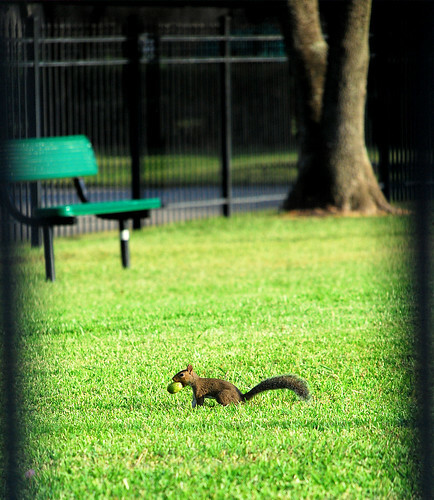 This little squirrel is gathering nuts in the early morning sunshine before Hurricane Ike gets to Houston. I wonder where he will spend the storm hours? We are expecting the storm to be in full force by about midnight tonight, and it should be already moved on by noon or so. Amazing how fast it is projected to get out of here. As you can see, right now it is very calm. As a matter of fact, I'm getting ready to go outside and trim the Rangoon Vine, which has really gone crazy and is reaching out all over the place. Sometimes this site has good stuff. Our house is almost 80 miles from the coast so please don't worry about the "certain death" applying to us. We will certainly will have some heavy rain and wind but we are not in an evacuation zone. The most we should have to worry about is the trees falling on the house... and believe me, the most vulnerable tree is being taken down this fall. The forecasted track looks to have shifted at bit more to the east... which is better for us but not so good for Galveston or further east on the coast. 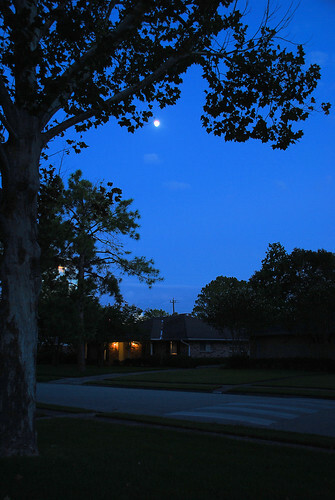 thursday night moon, originally uploaded by AmyEmilia. A bit comforting to know that we are not the only ones staying here. As a matter of fact, I talked to our next door neighbor just a couple minutes ago, and he said that he didn't think anyone in our street was leaving. I don't feel quite so foolhardy... on the other hand maybe we are all crazy. I like this new site: Storm Pulse. It has better graphics and interesting overlays. Check it out! Here at work I am getting my office ready for the storm - pictures off the wall, clearing the desk top, and so on. If a window should break, there are things that I don't want to get wet or go flying around the room. My husband has decided to stay with me instead of going down to the island - for which I am grateful. It is better to be together in things like this. I'll post more as time goes on! 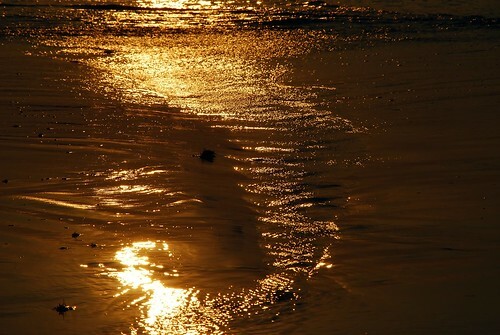 follow the golden path, originally uploaded by AmyEmilia. Houston is preparing for Hurricane Ike, which is expected (at this writing) to round the western edges of the city and head on up to Northeast Texas. We personally have prepared food and water for the recommended three days both here and in Padre. Our gas tanks are full too. Tomorrow my husband will get on the bus for Brownsville, and then on to South Padre. I will be here, to watch this house and also handle my responsibilities at work.